Additive manufacturing leaders from Arcam Group, MakerBot, Wohlers Associates, Inc, Shapeways, and Asimov Ventures are confirmed to deliver keynote sessions at the premier professional 3D printing event in New York City. 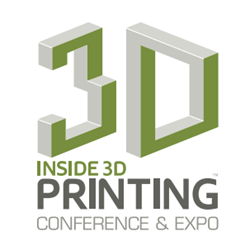 Rising Media, Inc. announced the agenda for the Inside 3D Printing Conference & Expo, taking place on April 10-12, 2016 at the Javits Convention Center in New York City. Now in its fourth edition in New York City, Inside 3D Printing is the leading professional 3D printing event worldwide. The conference program for Inside 3D Printing New York focuses on four key facets of the 3D printing industry, with dedicated tracks covering Business, Manufacturing, Medical, and Metal. Experts in these industries will discuss technological advancements, business challenges, and new applications of additive manufacturing. These focus areas mark Inside 3D Printing’s strong B2B roots, showcasing its commitment to business and industrial applications of 3D printing. “The Additive Manufacturing market is refusing to follow the hype curve predictions, as it continues to experience two digit CAGR year after year. A combination of new materials, new technologies, and new applications are driving this exponential growth,” said Hod Lipson, Professor, Columbia University and Inside 3D Printing Conference Chair. He continued, “This year we tried to create a program that gives attendees a taste of some of these new business models as well as a glimpse of new technologies just around the corner. It’s great to see all the predictions being corrected upwards." The event will also feature a keynote panel titled, “The Future of Metal AM: Delivering on the Promise.” Confirmed for the panel are: Geoffrey Doyle, President, FIT West Corp. (Moderator); Ric Fulop, Founder & CEO, Desktop Metal; Winthrop Sheldon, West Region Sales Manager, SLM Solutions; and Terry Wohlers, Principal Consultant and President, Wohlers Associates, Inc. Inside 3D Printing New York also features a full day of workshops, the Frontier Tech Showdown sponsored by Asimov Ventures, and an exhibit hall with 55+ sponsors and exhibitors. Inside 3D Printing New York is co-located with Rising Media’s RoboUniverse and Virtual Reality Summit. Prices increase on March 4, so register before to save with early bird pricing. For more information and to register for Inside 3D Printing New York, visit inside3dprinting.com/new-york. If your company is interested in sponsoring or exhibiting at Inside 3D Printing New York or an upcoming event, please contact sponsorship(at)risingmedia(dot)com. Following events earlier this year in Singapore and Düsseldorf, Inside 3D Printing has events confirmed for 2016 in São Paulo, New York, Sydney, Paris, Seoul, Tokyo, Shanghai, Mumbai, and San Diego. To learn more about upcoming Inside 3D Printing events, visit inside3dprinting.com/upcoming-events. For more information, please visit http://www.risingmedia.com. For press inquiries, please contact media(at)risingmedia(dot)com.